Modern Sailing School & Club gives students the choice of learning to sail either in a group course or on a private basis. On a private basis, we'll be happy to build a custom program to meet your personal sailing objectives. You can choose a time frame that fits your schedule. 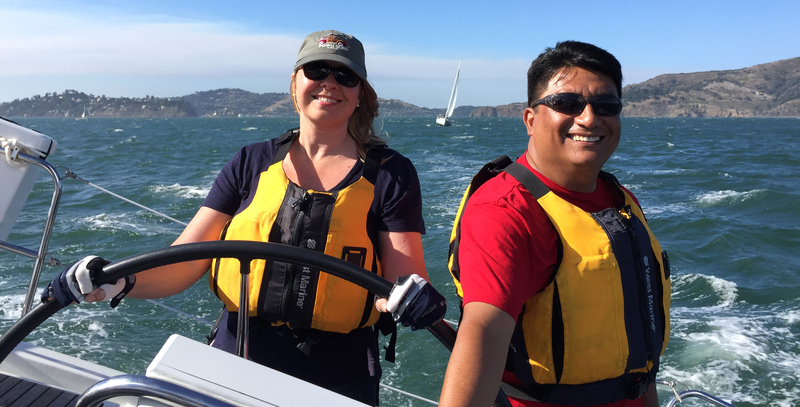 Whether your goal is to get certified, build your sailing resume for chartering, or simply learn new skills to make sailing more enjoyable, Modern Sailing can help you reach these goals. You'll be receiving expert instruction from one of our proven USCG Licensed Captains and have a yacht of your choice from 30-42 feet. We also offer lessons on privately-owned vessels. Simply add Modern Sailing School & Club as additionally insured on your marine insurance policy. Your instructor will inspect your vessel prior to departure and may postpone the lesson if the vessel is found to be in an unsafe condition. For pricing, visit our Skippered Charters Pricing page. We would be happy to work with you to design a custom program suited to your needs - email us, or give us a call (415) 331 - 8250.